Well, I obviously haven’t been updating much as of late. Since moving back home I did manage to find a job, and at a pretty neat place too. It’s called Langdon Hall. Mostly all of the other peeps working there are fantastic. I do bread two days a week and then work the pastry station a few days a week also. I love that I get to do different things. It’s basically wicked awesome. But it’s also the reason I haven’t been updating that much, because it gets my sleep schedule all out of whack when I switch between the shifts. Let’s not pretend here, I am a lazy bum so after work I generally don’t want to do anything. But today! Today my pretties, I made you a lovely cake! We all know I love me some cake. 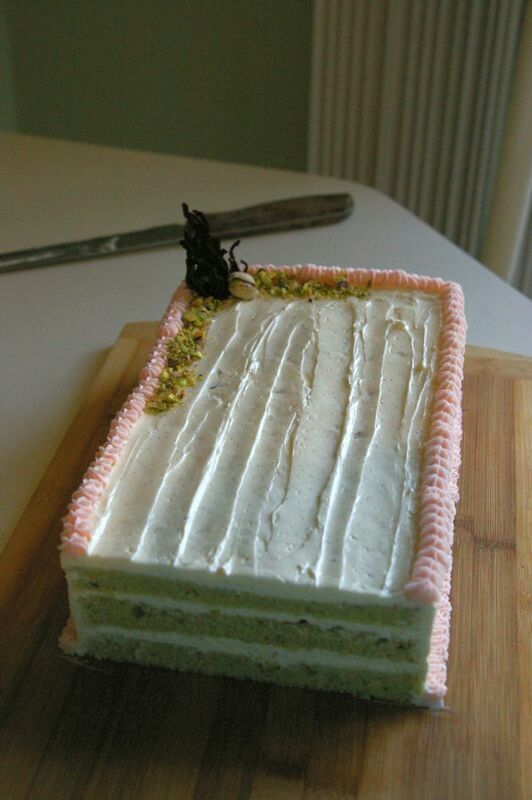 I made a pistachio cardamom cake with a rose buttercream. It’s super simple to make, awesome delicious, and the colours are really pretty! I had the whole thing made and assembled within 2 hours. Wicked! Preheat your oven to 350F and line a half sheet pan with a silpat or parchment paper and spray the whole thing with nonstick spray, or use butter. Whatever you fancy. If you can’t find ground pistachios, just quickly pulse them in a food processor but not too much as to bring out the oils and make a paste. In a bowl whisk together the ground pistachio, flour, salt, baking powder and cardamom (and pudding powder if using) and set aside. In a mixer fitted with the paddle attachment, beat the butter and sugar together until light and fluffy. Beat in the egg yolks, and then the vanilla and almond extract. On medium speed, add the milk and dry ingredients alternately just until combined. In a separate bowl quickly whisk the egg whites to semi-stiff peaks. Gently fold into the batter. They will deflate some since the batter is so heavy. Spread the batter evenly into the pan and sprinkle with the chopped pistachios. Bake for about 10-15 minutes or until the cake springs back when gently pressed. Let the cake cool completely before removing from the pan. Thanks to mother nature and the cold day we had today for cooling my cake down in 15 minutes. Awesome! In the mixing bowl over a double boiler, whisk the whites with the sugar until the sugar is dissolved. Transfer to the mixer and whip until stiff peaks have formed and it’s cooled down. At this point add in the butter and whip until it comes together. It might look separated for a bit but just continue to beat it at high speed and it will come together. At this point add in the vanilla and start with 1/2 tsp rose water. Beat and taste! Needs more rose? Add more! Add until you love it! The flavour does deepen as it sits so keep this in mind dear folks. When the cake is completely cool, use a ruler or measuring tape to cut the cake into three 5″ wide rectangles. Or cut it into four, or however many you want! Just make sure they are the same size. Layer them with buttercream! Yum. Save some and ever so slightly tint pink if you want to pipe a silly border like I did. Or a pretty one. Do what you want! 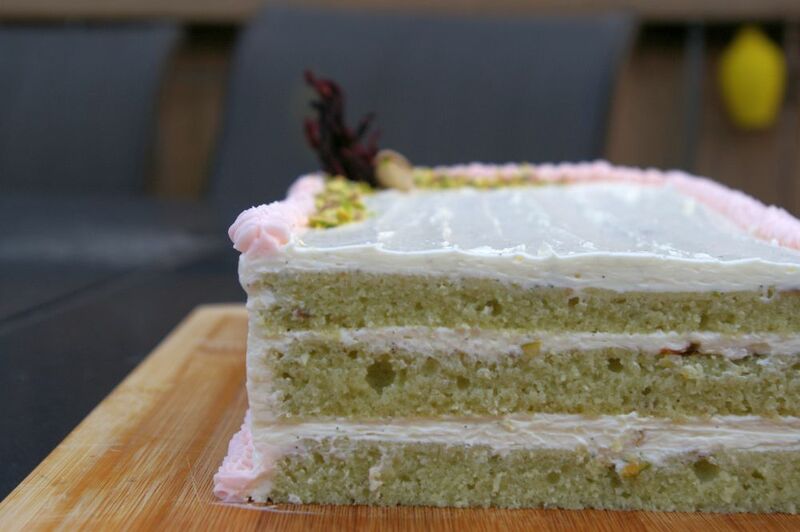 The reason I used pistachio pudding mix in my cake is because before I had caved in to going to the store, I didn’t have any actual pistachios. So I just added that in and used ground almonds instead (cheater!!). But then I realized I didn’t have enough butter for the buttercream so off I went to the store! I started off today in a terribly bitter mood but then when I started making this everything was cool. And now that it has turned out mega awesome I’m even happier! 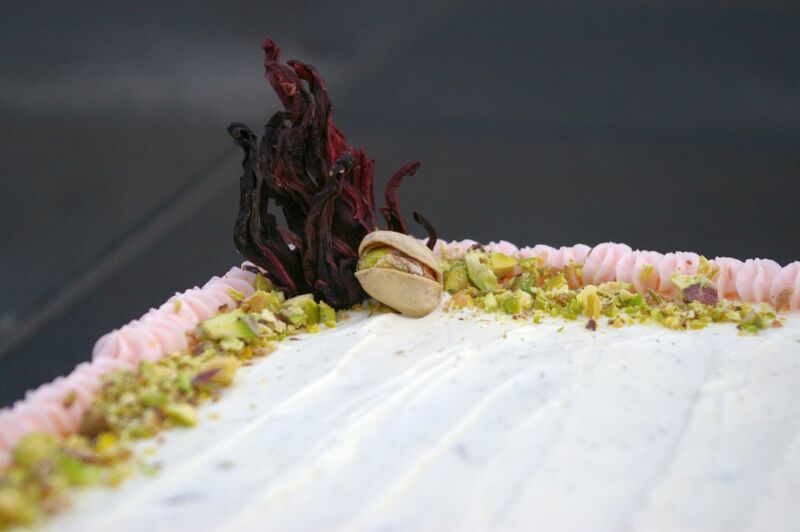 This entry was posted in Cake, Delicious things I think are pretty delicious, Partial Rants and Thoughts and tagged buttercream, cake, cardamom, happiness cake, nut cake, ohmygodit'sgood, pistachio, rose water. Bookmark the permalink.